<36 Hours in Pinehurst, N.C. I found this recipe in House Beautiful while paging through a bunch of magazines. I mean look at that ^. If that’s not a food photo that makes you salivate, I don’t know what is. 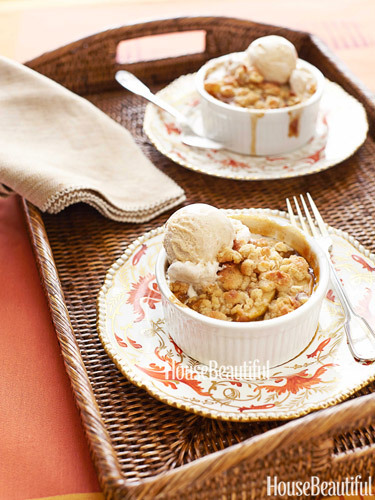 I love apple crisps, crumbles and pies, and I’ve had more than my fair share of them over the past 35 years. My mom is partial to Ina Garten’s apple crisp recipe, which is delicious. I’ve made it a couple of times, but it never tastes as good as when my mom makes it for holidays and special celebrations. Fashionista came to visit us one weekend this past winter and I wanted to step up the game and treat her/us to an “adult” dinner party. I will include a couple of the other recipes we tried (because we nailed it) and this crumble was the real show-stopper. I’ve never had a better crumble anywhere. I’m including the ice cream recipe the author included, however I have not made the ice cream. Turning this into a la mode is definitely a must for those with a serious sweet tooth. This crumble serves 10-12 people. 1. Preheat the oven to 375° F. Butter a 13″ x 9″ x 2″ ceramic or glass baking dish. 2. In a large skillet over medium-high heat, melt the butter. When the foaming has subsided, add the fruit and sauté for 2 to 3 minutes, until it begins to get soft. Add the remaining ingredients except the flour, and continue to sauté for 8 to 10 more minutes, until the sauce is a rich caramel and the fruit is soft. 3. Add the flour and stir to incorporate. Sauté for another 2 minutes, then remove from the heat. 4. To make the crumbs, in a large mixing bowl, whisk the dry ingredients together. Add the vanilla and mix well, then cut in the butter with a pastry cutter until coarse crumbs form. 4. Pour the fruit into the prepared baking dish, and spread the crumbs on top. Bake for 30 minutes, until the crust is brown and the sauce is bubbling. Serve with the ice cream. 1. In the bowl of an electric stand mixer fitted with the whisk, beat the eggs and sugar together on medium-high speed until they are light, about 5 minutes. 2. Over medium heat, cook the eggs and sugar in the top of a double boiler until just thickened, stirring often. Remove from heat and add the remaining ingredients. Freeze the mixture in an ice cream maker according to the manufacturer’s directions. Let me know if you give this a try. Hope you enjoy it as much as we have (3 times now)!